SPARTA, Ky. — What was Kyle Busch’s dominant impression of his victory in the inaugural NASCAR Sprint Cup race at Kentucky Speedway? It wasn’t that he’ll be written into the record book as the first Cup winner at the 1.5-mile track, the first speedway introduced into the series in 10 years. No, Busch will remember Saturday’s Quaker State 400 at Kentucky as the last thing he won on the way to his next race—in this case Sunday’s marquee Super Late Model event at Slinger Speedway in Wisconsin. 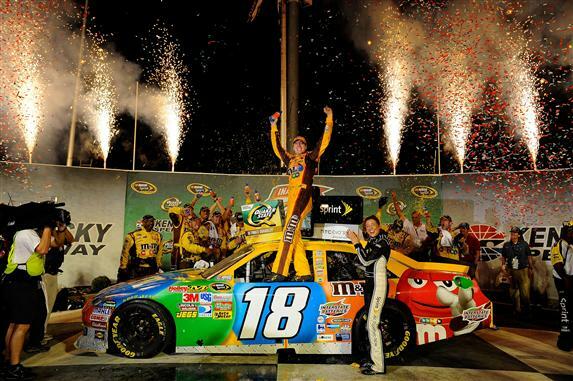 That’s the way Busch thinks—win and move on. In holding off fast-closing David Reutimann and Jimmie Johnson in a two-lap stretch run, Busch won for the third time this season, the 22nd time in his Cup career and the 99th time across NASCAR’s top three national series, third most all-time. Even though he won two of the three events at Kentucky Speedway over the weekend—he won the Camping World Truck Series race Thursday—Busch wasn’t thinking about the numbers, not even that he had leap-frogged past Kevin Harvick (16th Saturday) and Carl Edwards (fifth) into the top spot in the series standings. Saturday’s race wasn’t settled until Busch kept Johnson at bay on the last restart, clearing Johnson’s No. 48 Chevrolet off Turn 2. Reutimann restated in the fourth spot but charged forward, passing Johnson just short of the finish line on the final lap. Reutimann finished .179 seconds behind Busch. Johnson said his inability to stay beside Busch on the next-to-last lap cost him a chance to win the race. “I was able to hang with the 18 (Busch) inside of Turns 1 and 2, and he just cleared me going down the back,” Johnson said. “The outside lane had a little bit more momentum coming off of (Turn) 2 down the back. If I could have stayed inside of him, it would have been one heck of a finish at the end. Ryan Newman played pit strategy perfectly and came home fourth, followed by Edwards. Matt Kenseth, Brad Keselowski, David Ragan, Kurt Busch and Jeff Gordon completed the top 10. Busch had regained the lead during a cycle of green-flag stops late in the race, but a caution for Dale Earnhardt Jr.’s blown left front tire slowed the race for the fifth time and set up a restart on Lap 260 of 267. Busch pulled away, with Johnson chasing, but Clint Bowyer’s wreck in Turn 2 bought out the sixth caution on Lap 262 to bunch the field for a restart with two laps left. During a 105-lap green-flag run that began on Lap 36 after a competition caution and included two rounds of pit stops, Busch opened a lead of more than eight seconds, but his advantage disappeared when NASCAR called a caution on Lap 140 for debris on the backstretch. Keselowski and Tony Stewart opted not to pit under the caution and restarted on the front row on Lap 147. Earnhardt, who had fallen off the lead lap during the long green-flag run, got his lap back on a wave-around, and a quick caution on Lap 151 gave him a chance to pit for fuel and tires. Keselowski and Stewart ran 1-2 after a restart on Lap 158, but both drivers had to pit for fuel early in the next cycle, and Busch reclaimed the top spot when Keselowski brought the No. 2 Dodge to pit road on Lap 186. When Jamie McMurray’s engine erupted like Vesuvius on Lap 200, bringing out the fourth caution of the race, the lead-lap cars were back on similar pit cycles. Busch, who led a race-high 125 laps, opened a four-point margin in the series standings over second-place Edwards and a 10-point cushion over third-place Harvick.